The Samsung Galaxy Fold isn't available yet, but someone has got a hold of it already and posted a video, revealing that the crease where it folds might be very visible. YouTube user phoneoftime posted a hands-on video which you can see below, and the crease running down the middle of the screen when unfolded is noticeable throughout. What's not clear is whether this unit – which is locked to AT&T – is a retail version or a pre-release prototype. If the latter, then it’s possible that the crease has been ironed out for the versions that will go on sale. It’s also unknown just how much use this unit has had. After all, even Samsung admits that once the screen has been folded enough times a crease is bound to become visible – though Samsung puts the number of folds necessary at around 200,000, while a source speaking to Bloomberg said it can become visible after just 10,000 folds. So a lot of questions remain on that front. As does the question of how much a crease really matters. It’s certainly worrying, particularly in a device that’s set to cost $1,980 / €2,000 (around £1,500-£1,700, AU$2,800-AU$3,200), but it could be something that you’ll cease to notice with use, just like notches and punch-hole cameras. Only time will tell. Crease aside, there’s not a huge amount to see in this video that hasn’t already been revealed. But you can see that the Galaxy Fold looks predictably chunky when folded, but that the actual operation of the phone appears smooth, whichever screen you’re using. 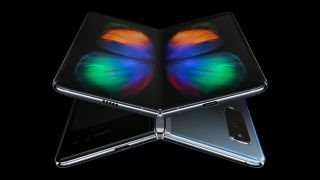 With the handset hitting US stores on April 26 and European ones on May 3 we’ll have a better idea of how good Galaxy Fold is and how visible that seam is soon, but this might be one to wait for reviews of.